Horsham, PA — Sunday, August 25, 2013 at 12:00 noon. 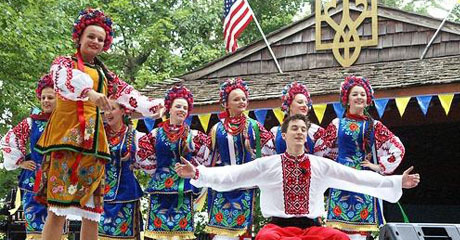 The 22nd Annual Ukrainian Folk Festival, will be held at the Ukrainian American Sport Center – Tryzub, County Line and Lower State Roads, Horsham, PA. The general public is invited to attend. From the rich color and deep symbolism of the delicate “pysanka” (Ukrainian Easter Egg) to the thunderous, power, rhythm and strength of “HOPAK” – the world’s most exciting ethnic dance, and every brilliant “Kolomiyka” (polka) and soulful folk song in between, we invite you to experience the TWENTY- SECOND ANNUAL UKRAINIAN FOLK FESTIVAL, celebrating the anniversary of our ancestral homeland’s independence. Enjoy a festival stage show, a public social dance, Ukrainian foods and baked goods, BBQ pit, kid’s fun area, and Ukrainian hospitality. CONCERT & STAGE SHOW AT 1:30 – 4:30 P.M.: Enjoy VOLOSHKY UKRAINIAN DANCE ENSEMBLE (Jenkintown, PA) (www.voloshky.com); ISKRA UKRAINIAN DANCE ENSEMBLE (Whippany, NJ) (Facebook); Violinist INNESA TYMOCHKO DEKAJLO (Lviv, Ukraine) (www.innesa.com ); and THE VOX ETHNIKA BAND (New York City); (www.voxethnika.com). 4:30 – 8:00 P.M. — A Ukrainian Public Dance (Zabava) to the live Ukrainian polka, ballroom, traditional and modern music of the VOX ETHNIKA BAND will follow the stage show. Ukrainian ethnic foods, baked goods, standard picnic fare and cool refreshments will be plentiful. Also enjoy a children’s fun area and a folk arts and crafts bazaar. Info: 267-664-3857; eluciw@comcast.net; website: www.tryzub.org.